The United States is home to about seven species of doves, including the Eurasian collared-dove, common ground-dove, white-winged dove and band-tailed pigeon. However, the most is known about the migratory and nesting habits of the mourning dove, the most widespread dove species in the U.S., thanks to a nationwide banding study conducted by the U.S. Geological Survey. The mourning dove is a plump bird with a small head and a long, slender tail that tapers to a point. The back is brownish-gray flecked with black, and the breast coloring ranges from tan to light rose. When in flight, the dove spreads its tail feathers in a fan shape, exposing tail feathers edged in white. The mourning dove’s name comes from his distinctive call, which sounds like a mournful lament. Mourning doves are one of the most populous and widely distributed birds in North America, according to the Oklahoma Department of Wildlife Conservation. Their year-round range covers most of Mexico and the contiguous U.S., with the exception of the northernmost Midwestern states. They can also be found year-round throughout the islands of the Caribbean. They are also one of the most widely hunted game birds, with dove hunting seasons established in 37 states. According to the Cornell Lab of Ornithology, more than 20 million mourning doves are harvested by hunters each year, and yet they still remain extremely abundant throughout the U.S.
Migratory mourning doves spend winter in the southern states and Mexico, even flying as far south as Central America. They typically fly south in large flocks, leaving their northern range as the weather cools off in late August or early September. In March and April, these birds leave their flocks to fly north for the nesting season, when they can be found throughout all of the northern states and southern parts of Canada. Not all mourning doves are migratory, however. Residential doves can be found year-round in the temperate Southern states, where they have a longer nesting season than migratory doves, according to Warnell School of Forest Resources. Regardless of whether or not they migrate, mourning doves who have successfully raised a brood will return to that same nesting site year after year, according to the Diamond Dove website. Nesting parents don’t range far from the nest. Once the brood leaves the nest, both parents and juvenile doves travel within a home range of about 10 square miles from the nest, traveling up to 3 miles at a time between feeding and roosting sites. 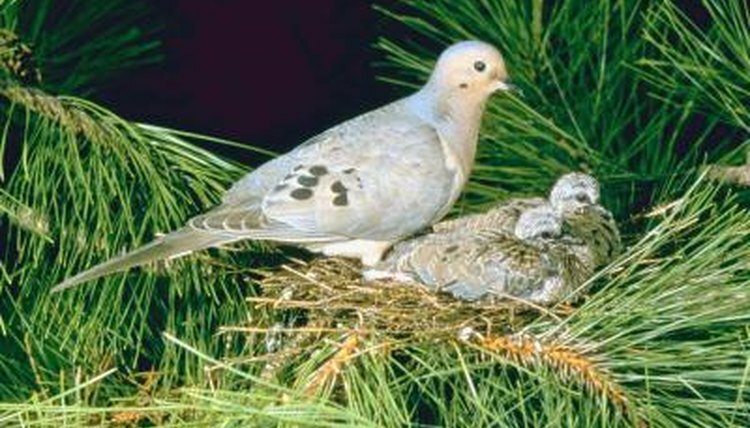 During the summer nesting season, local dove populations increase with the addition of young doves. By the time dove hunting season begins in the fall, it’s usually the local and residential doves that remain after migratory birds have flown south.